Well, ladies and gentlemen, it's time for another installment of Doug DeMuro: Safety Crusader, an occasional column I write when I can't think of anything important to say. Haha! No! I'm just kidding! My tremendously helpful Doug DeMuro: Safety Crusader series highlights all of today's most serious issues that affect a wide variety of modern Americans, but primarily the kind of safety-obsessed helicopter parents who provide their child's first-grade teacher with a "list of acceptable foods" that includes hummus. Regular readers will remember my last safety crusader column, in which I stated — in a very subtle way, so I didn't upset any of my dearly appreciated readers — that lifted pickup trucks are the single most dangerous thing in existence. This was an especially popular column, as judged by the number of angry e-mails I received from places like Idaho. Out there, it is apparently compulsory to own a lifted truck, or else you will be shunned by society and forced to do something crazy, such as vote Democrat. Oh, and speaking of Idaho, I think it's important that I take this moment to issue a quick apology to our Idaho-based readers. Over the last few weeks, I've taken a few jabs at Idaho, which led to a little, shall we say, hostility, from some folks. One reader, for example, called me "Doug DeDouchebag," and then, later, in the very same comment, referred to me as a "vapid, shallow prick." Apparently Idahoans take this sort of thing very seriously. Since my insults were primarily directed at Idaho being a boring, rural wasteland with not much going on, I decided to head over to the local Boise NBC affiliate's website to see just how exciting and thrilling the place actually is. Given that the top headline is "Meridian Neighbors Fight Gravel Pit's Permit Extension," I see now how wrong I was. And I apologize. Anyway: back to the issue at hand, which is safety. (Really, it is!) Today's topic is HOV lanes, also known as "high-occupancy vehicle lanes," or "carpool lanes," or, for those of you reading this in California, "the lanes where those rich assholes drive their Teslas." Now, before we get into my theory about HOV lanes, which is that people who drive slowly while using them should be arrested on the spot, I think it's important to explain precisely what these lanes are. This is primarily for the benefit of people who haven't spent much time with HOV lanes; people, for example, from large western states that rhyme with "Flydaho," where the main leisure activities are a) huntin', b) fishin', and c) writin' angry e-mails to automotive journalists. 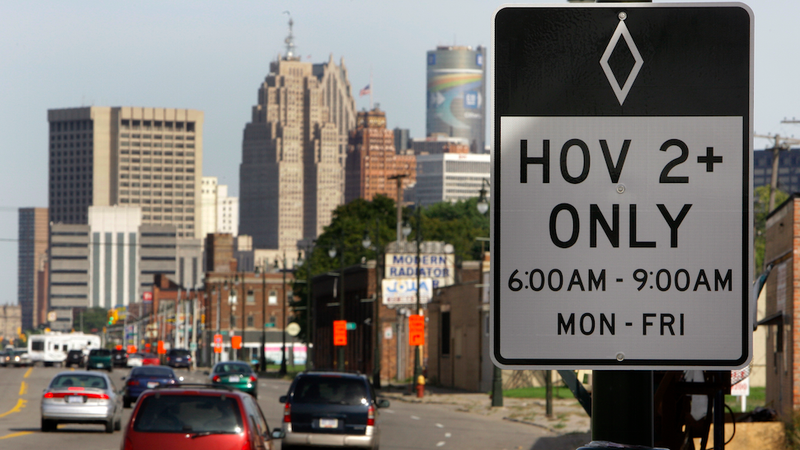 If that sounds like you, here's the deal with HOV lanes: you use them if you have more than one person in your car. The theory here is that people who commute with only one person, and therefore destroy the environment for future generations every time they drive to the office, will see these people and think: OH! YOU CAN GO FASTER IF YOU HAVE MORE THAN ONE PERSON IN YOUR CAR! And then they chuckle and don't change their behavior at all, because who the hell wants to get to the office any faster? So anyway, we have a lot of these HOV lanes here in the Atlanta area, and I've discovered that there are two ways to use them: the right way (technically defined as "the way I use them") and the wrong way (defined as "how most other jackasses use them"). I will now demonstrate the differences. 2) Signal your way into the HOV lane. 3) Continue driving at the exact same speed as everyone in the normal lanes. What I've noticed — and I might be completely off base, so please feel free to correct me in the comments by calling me a vapid, shallow prick — is that many people seem to view the HOV lane as a place you go whenever you have more than one person in the car. "Well, Diane, it's you and me today," is how I imagine most of these people start their HOV lane-related conversations. "Better go over to the HOV lane in order to show all the other drivers that I'm not alone." Now, of course, when you're in heavy traffic, this isn't much of a concern. That's because, in this situation, the HOV lane is usually moving faster than the normal lanes, so you don't have to worry about these HOV lane cloggers screwing up your day. But when traffic is moderate, and I have more than one person in the car, what I usually do is I shoot over to the HOV lane to try and get ahead, because God knows the left lane doesn't serve that purpose, only to find myself blocked by some jackass who's going the exact same speed he could be going in the normal lanes. And of course, by this point, the HOV lane is surrounded by solid white lines that prevent you from getting out, meaning you're stuck in this hell until you can't take it anymore, and you go around him, and a cop pulls you over for going over the solid lines, and he searches your car and finds 400 pounds of crystal meth. This, uh, happened to a buddy of mine. What I want to tell these people is: the HOV lane isn't for show. It shouldn't be used to prove to other road users that you have more than one person in the car. It's an express lane, primarily intended for express traffic, such as airport limo drivers who consider the Lincoln Navigator to be a "tall sports car." Unfortunately, it's not like you can get out and just say this to the lane-cloggers, primarily because they're usually playing NPR too loudly to hear you. So I've come up with a plan for these HOV lane-cloggers, namely that they should be arrested upon their first violation and send to prison without trial. This will make our roads significantly better in two ways. Number one: the kind of people who enter the HOV lane just to obey the speed limit are the same people who back into your parked car in a grocery store parking lot. Things will be safer if they're off the roads. And number two: I will be able to go everywhere just a little bit faster. Which could come in handy, in case my Idaho readership ever decides to visit Atlanta.